This was my 3rd trip to Bryce, but the first time staying in the campground here, so it was handy and we had time to see and do more. 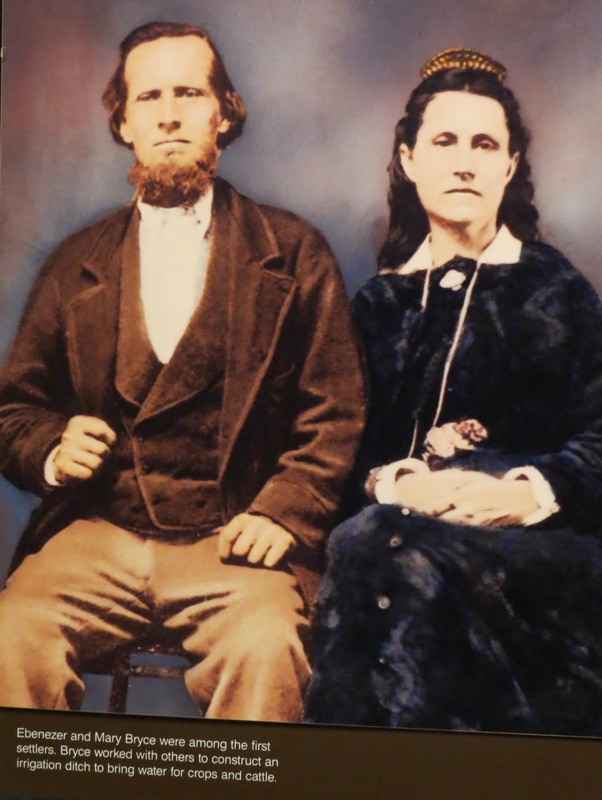 We started with the Visitor Center where we read about the Park's namesakes, Ebenezer and Mary Bryce, who homesteaded in the valley here starting in 1874. Then we took the shuttle to see some of the viewpoints. On the way we passed the Prairie Dog town. Our first stop was Bryce Point. We walked a little way down the "Under-the-Rim Trail to get these two shots. 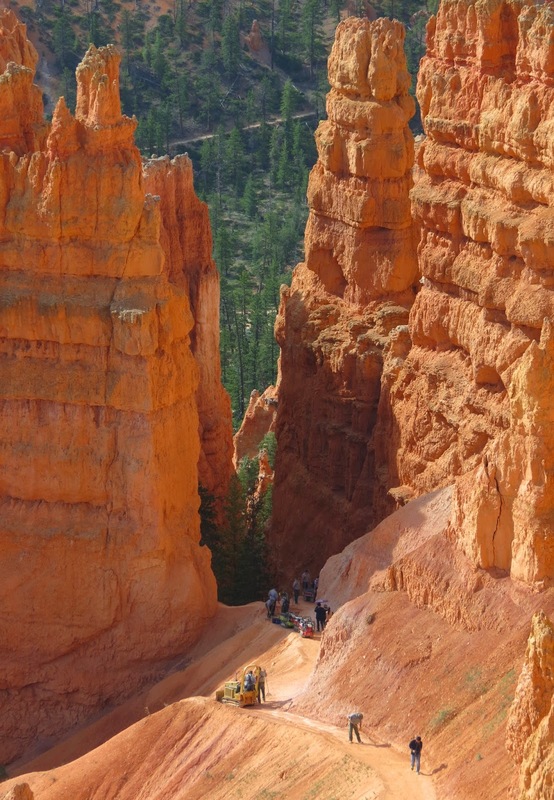 Bryce Canyon is most famous for the colorful sandstone "hoodoos," shaped by erosion. It is still a work in progress. Our next stop was Inspiration Point. The walk looks easy, but at 8100 feet elevation, it felt difficult. I thought this little tree was inspiring. Next we went to Bryce Lodge where we signed up for a mule trip into the canyon for the next morning. And we had their buffet lunch. The baby pine cones look like flowers on the tree. Early evening we walked up to the Rim Trail behind the campground. Hoodoos on the Rim Trail. Some people carry their camp chairs up here to enjoy the view and perhaps sunset. We could see a storm brewing in the distance, but it never reached us. Birdie identified this Townsend's Solitaire. Rainbow Point, elevation 9,115 feet. Snow on the distant mountains. We hiked the Bristlecone Loop Trail here, but between the elevation and the mule ride, we were really not enjoying it that much, lol. I thought this tree within a tree was interesting. Raven was the official greeter today. This viewpoint was called Agua Canyon, although we didn't see any agua. But we had a bird's-eye-view. 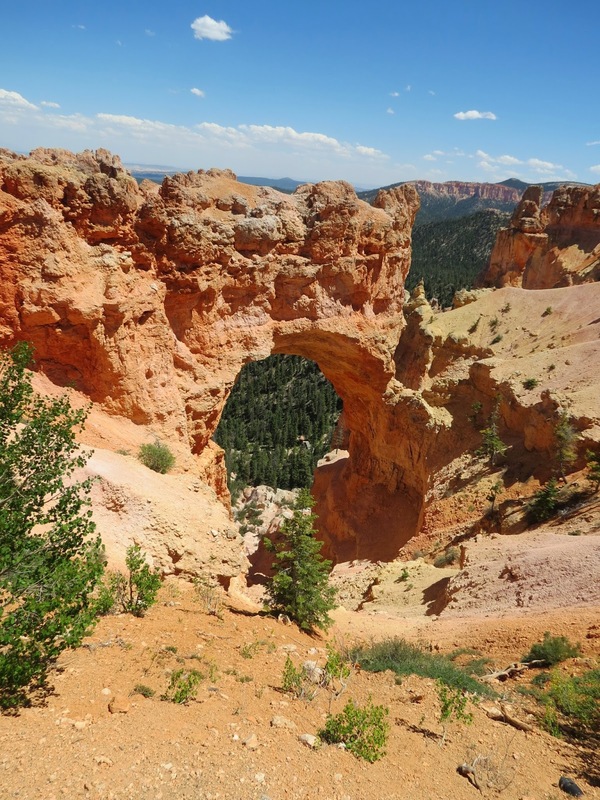 This is called the Natural Bridge, although arch is a better description. Far View Point lives up to its name with a view in the distance of the Grand Staircase-Escalante National Monument where we planned a day trip for the next day. The next morning we packed a lunch, brought Thistle, and drove east on UT 12 Scenic Byway, which takes you through part of the Grand Staircase-Escalante National Monument. UT 12 as it descends into the canyon of red and grey slickrock formations. The winding road is popular with motorcyclists. Petroglyphs can be seen on the cliffs from here. That is the Escalante River below. But you need binoculars or zoom lens to see them. We decided to hike the trail along the river where the Petroglyphs are. But first you have to cross the river. The trail was not very good. So much sand clung to our wet shoes that it felt like our feet weighed 10 pounds each. So we sat by the river to have lunch. Thistle eating his kong-toy packed lunch. Then we walked back to the car to resume our tour of Rte 12. This section of the road is called "The Hogback." It follows a ridge with steep drop-offs and no guard rails. But there are great views from the ridge. It's hard to get a picture of the 360 degree view. 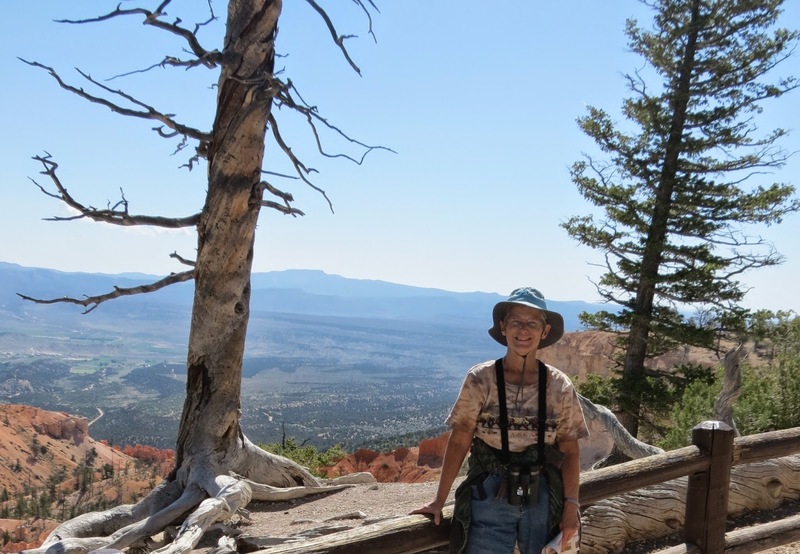 Our last day here and we decided to hike the Rim Trail from Sunrise Point to Sunset Point. It is the only trail where dogs are allowed, so Thistle came too. A Limber Pine grows atop a hoodoo. It probably started as a seed cached and unclimed by a Clark's Nutcracker. 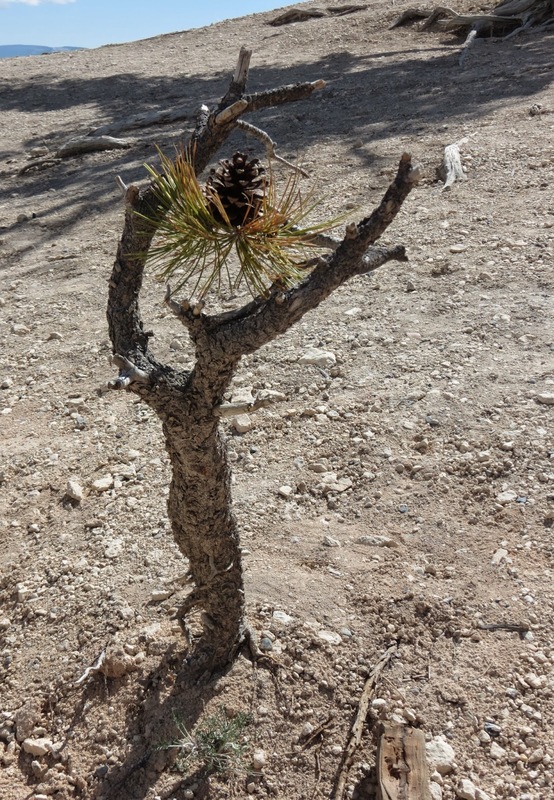 Many Limber Pines take root in harsh places where less hardy trees are unable to survive. Although small, this Limber Pine is over 100 years old. View of the Queen's Garden Trail. Thistle eye-view of Bryce Canyon. Rangers are below repairing trail damage caused by rockslides on the Navajo Trail. Hikers passing the damaged area. It was a Bluebird kind of morning. 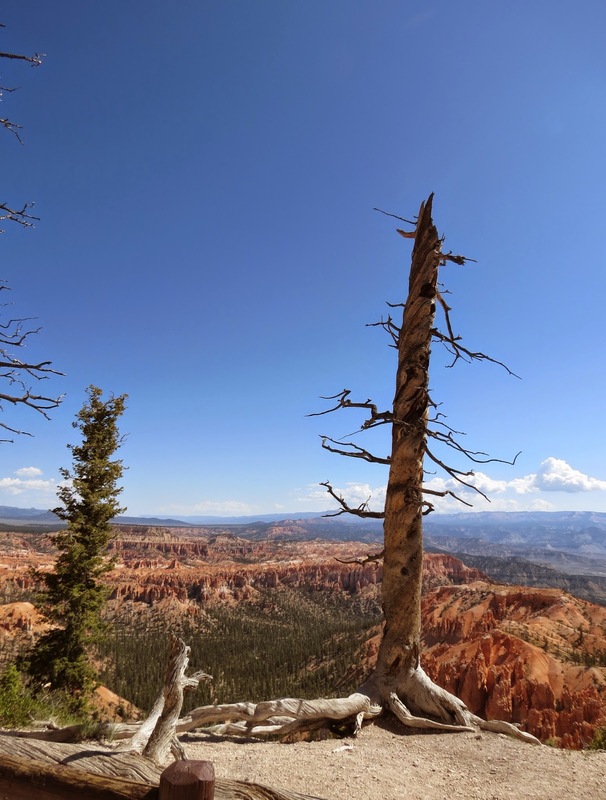 Tomorrow we leave Bryce and go a short ways to Navajo Lake for a few days of R&R in the kayak, some more hikes, and a day trip to another of Utah's National Monuments.